NEW YORK (AP) -- A rediscovered painting by Frida Kahlo is going to auction this month in New York. The 1929 portrait, called “Nieuroa con Collar” or “Girl with Necklace,” will be part of Sotheby’s Latin America: Modern Art sale on Nov. 22. Its presale estimate is $1.5 million to $2 million. Kahlo’s husband, artist Diego Rivera, gave the work to her personal assistant in 1955, the year after she died. Until it surfaced over the summer, the only record of the portrait had been a black-and-white photo. The work was painted before Kahlo and Rivera were married; they had no children, according to Axel Stein, Sotheby’s head of Latin American Art. The unknown, unsmiling, wide-eyed model, perhaps 14 or 15 years old, appears to represent a young Kahlo. She is wearing the artist’s jade necklace and possibly her earrings, said Stein. 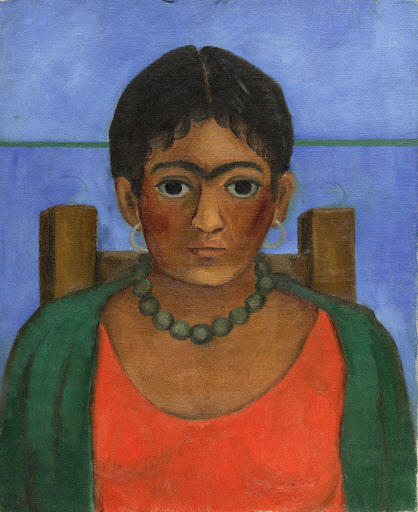 The subject also is depicted with dark, distinctive eyebrows resembling Kahlo’s. The painting is about 56 by 56 centimeters. “I never imagined it would surface and turn out to be such a beautiful and warm painting,” Stein said. The owner hung it in a darkened bedroom in Sunnyvale, California, for six decades; because of her art expertise, she knew it should be kept out of the light.